Among GNOME 3, Ubuntu Linux's Unity, and Windows 8's Metro, there's no denying that desktop environments have become a hot topic in 2011. More specifically, mobile-inspired interfaces are becoming increasingly commonplace, challenging users to accept a whole new paradigm in the desktop world. It remains to be seen how well users ultimately adapt to these new-style environments--particularly those who have been using more traditional interfaces for a long time--but in the meantime, it looks like another contender has emerged. Razor-qt is a new, lightweight desktop environment based on the Qt framework that aims to offer a new alternative. It's now available for free download; the screenshot below offers a taste of what Razor-qt looks like. Open source Razor-qt also works well with “weak machines,” the team added in a blog post earlier this month. Currently in version 0.4.0, Razor-qt recently gained a tool for launching applications, new configuration tools, and a standalone library for XDG standards, among other features. Also included in this latest version are fixes for memory leaks, improved translations support, and a new theme, among many other features. The desktop environment is apparently similar to KDE, and it works with most window managers. Now included in it are a panel, desktop, application launcher, settings center, and sessions, but it's up to users to decide which of those components to use. 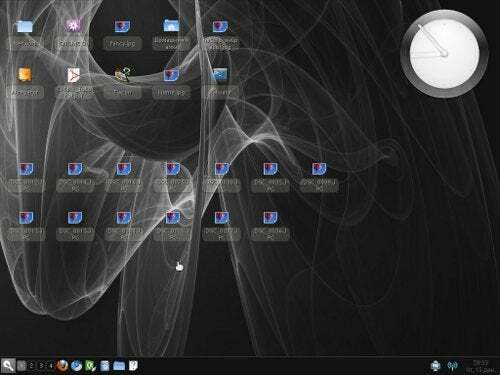 The video below from Hungarian Unix Portal demonstrates Razor-qt in action with Ubuntu 11.10. As mobile-style, touch-enabled interfaces become the norm on desktops as well, giving users a choice will increasingly be a distinguishing feature that sets operating systems apart, I predict. If at least some of those choices can offer non-mobile-style alternatives, all the better. How will Razor-qt fare against numerous long-standing competitors? That remains to be seen. In the meantime, though, more choice is always a good thing.